Woo-Hoo--looks like I was tippling a few when I made this card. My glass is a little askew. This is one of my new stamps from Stampingbella, the more I use their stamps and see the new images they are coming out with, the more I like them. I finally broke down and purchased some little fairies from them. One might be debuting later tonight. It's nice and quiet here and I'm on a creative roll. I made this card for my sister's husband, he's a Jan.2 baby, so on the inside it will say,"Raise a glass of cheer to your Happy Birthday and a Happy New Year!". Cute Card Thursday Challenge 92-Happy New Year! Supplies: Black Card Blank 5" X 6 1/2" Halcraft, Papers: Best Occasions Pearlescent Paper Pack, Stampin Up-Shimmer White, red from stash, Stamp: Stamping bella-ks122 valentini, Ink: VersaMark Ink pad, Stampin Up clear embossing powder, CTMH marker-cranberry, Sharpie Poster Paint pen-silver, Sakura Gelly Roll pen-silver, red crystal stickers, red fun fur, silver ribbon-Offray, Ranger Glossy Accents, Stampin Up-ticket punch, EK Success-Champagne punch, Cuttlebug Embossing folder-Spots & Dots, pop dots. Very cute! 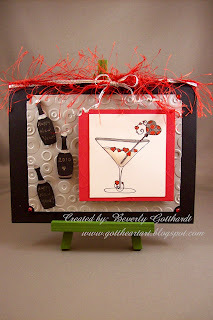 I have always loved Stamping Bella's martini stamps. I have a couple myself. You did a beautiful job and I'm sure your brother-in-law is going to love his card. --Very well done on all the challenges! Break out the bubbly for this festive card extraordinaire! I lurve those little bottle brads and that awesome image...thanks so much for joining in the festivities, hee!